NOTE: Actual ISEQ Q3 2012 YTD performance (i.e. from Dec-30th) of 13.0% is significantly higher than my benchmark (due to strong ISEQ gains in the first 5 weeks of 2012). 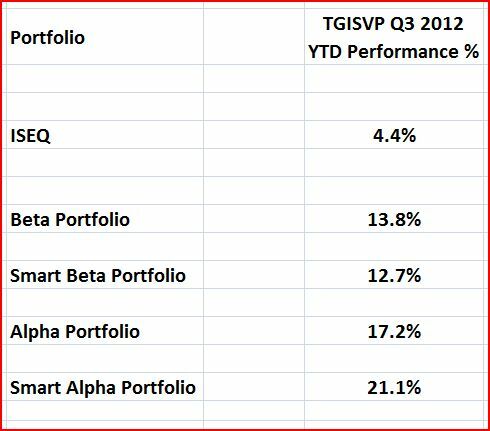 However, if yr-end share prices were used to evaluate the TGISVP portfolios, YTD performance would presumably be much higher also. Beta Portfolio: We assume an investor goes equally long all 36 stocks with positive Upside Potential (e.g. invests EUR 1 in each stock, for a total of EUR 36). The 39 other stocks, identified as neutral (2) or over-valued (37), are ignored. Gain/Loss% on each stock’s measured from the share price at the time of valuation/publication to the end of Q3. The portfolio return contribution for each stock’s simply its Gain/Loss%/36. Smart Beta Portfolio: Stocks chosen on the same basis as the Beta Portfolio, with one key twist: All 36 stocks are divided into quartiles, and it’s assumed EUR 4 is invested in each of the top quartile stocks, 3 EUR in the next quartile, and so on down to EUR 1 in the bottom quartile stocks (for a total of EUR 90). This preserves diversification, but concentrates portfolio bets on the stocks with the most Upside Potential. Alpha Portfolio: Exactly the same as the Beta Portfolio, on the Long side… But we also assume a Short overlay (yes, rather theoretical I know..!) of all 37 over-valued stocks. We’ll invest EUR (1) in a short position in each of these stocks, so essentially we’re adding a (different) inverse Beta Portfolio. Smart Alpha Portfolio: Exactly the same as the Smart Beta Portfolio on the Long side. But again we assume a Short overlay of all 37 over-valued stocks. In a similar manner, we’ll divide these into quartiles also, and invest from EUR (1) to EUR (4) (for the most over-valued quartile) in short positions in these stocks. Instead, the Alpha portfolios (by necessity) really boil down to classic stock selection – going long the good stuff & going short the crap..!